When a country takes the gold and bronze medals in the same discipline at a Grand Prix it would usually be considered a successful weekend. The joy for Japan at the Cup of Russia, however, was tempered by the injury suffered by two-time Olympic champion Yuzuru Hanyu after his triumph and Kazuki’s Tomono’s third-place finish. A day after one of the greatest performances in his career in his short program to “Otonal,” the superstar twisted his right ankle during an unfortunate fall on a quadruple loop in the morning practice on Saturday in Moscow. Despite barely being able to walk, Hanyu pulled on the boots for the free skate a few hours later and scored a convincing victory. It was a courageous performance by the Sendai native, who could have easily withdrawn, but once again took into account the feelings of the many fans who had traveled to see him compete as well as his desire to honor Evgeni Plushenko. So many athletes in other sports will beg off at just the slightest hint of an injury these days. It has become an absolute disgrace in recent years. Take a look at the NBA if you want some reference. But Hanyu is a different breed. He is old school and takes us back to the days when men were men and toughness was admired. Time and again he has answered the bell when he was injured. There was the Cup of China collision with Yan Han in 2014, the serious ankle injury at the NHK Trophy last season, and now the fall in Moscow. The questions now revolve around Hanyu’s potential fitness for the Grand Prix Final next month in Vancouver, British Columbia, and the Japan nationals in Osaka. It seems highly unlikely he will be able to compete in either. As disappointing as that is, Ice Time is certain that fans don’t want to see Hanyu’s ankle problem become a chronic one. I think that is the risk here. He needs to let the injury completely heal before resuming training. Yuzu is such an aggressive athlete that holding him back is not easy. This is where coaches Brian Orser and Tracy Wilson are going to have to step in and protect Yuzu from himself. Hanyu no doubt feels worse about the injury than anybody. Of course he wants to be out there competing. I feel bad for the fans in Japan who have not seen him skate competitively in-country for two years (since the 2016 NHK Trophy in Sapporo) now. If he is ruled out of nationals, that time period will stretch to nearly 2½ years, with the next chance coming at the world championships in Saitama next March. It is important to keep in mind that not everybody can spend money to travel abroad and watch Hanyu compete. Overshadowed due to the focus on Hanyu’s injury, was the fact that the win in the Russian capital marked the first time in his senior career that he has won both of his GP assignments in one season. Hanyu’s world record of 110.53 points in the short program on Friday was really phenomenal. I remember feeling that he was finally fully healthy again as he soared so high on his jumps. Eurosport’s Simon Reed continues to shower Hanyu with praise. “It’s got to a stage now where he almost transcends the sport,” Reed stated after Hanyu’s short program. “Rather like Tiger Woods a few years ago or Roger Federer. Reed’s broadcast partner Chris Howarth tried to provide an answer. “He obviously still has a love for the sport and a love for competing,” Howarth remarked. “To be honest, he makes it look easy. Every movement is finished off. The attention to detail in the program is second to none. The experts even marveled during Hanyu’s free skate to “Origin” in which he had to improvise and move jumps around due to the injury. Tara Lipinski, the 1998 Olympic champion, kept her analysis succinct on NBC. “When he touches the ice it’s magic,” Lipinski commented. Perhaps Reed put it best when Hanyu took the ice for his free skate. 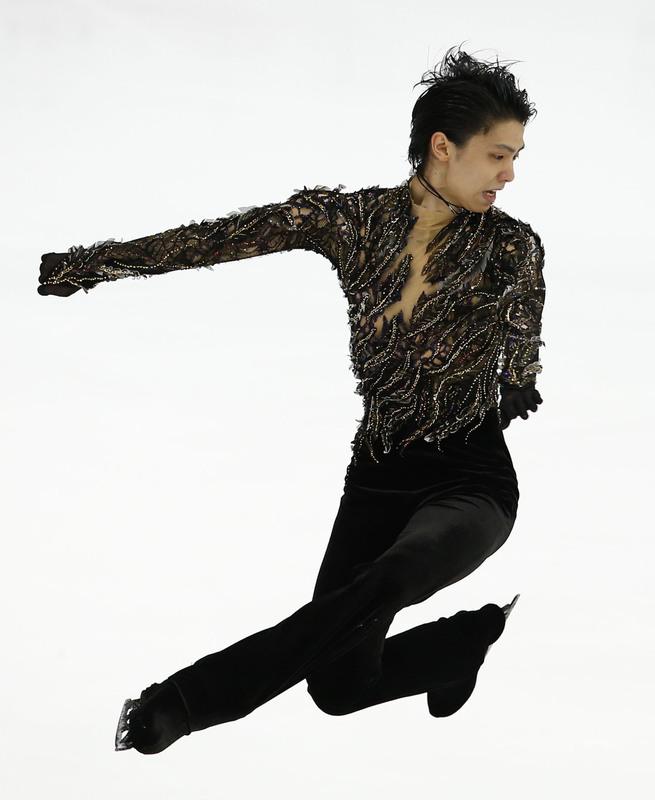 “The god of figure skating,” Reed said as Hanyu was introduced. Tomono landed a pair of quads and five clean triples to earn the first senior GP medal of his career. Howarth liked what he saw from Tomono in his free skate. As he reviewed Tomono’s elements, Howarth saluted the Osaka native’s competitive balance. The GP circuit moves to its final stop this week when the Internationaux de France takes place in Grenoble, the site of the 1968 Winter Olympics. There will be a lot at stake at this event, as Rika Kihira and Mai Mihara try to qualify for the GP Final, while Marin Honda looks to get herself back on track. Kihira stunning’s performance at the NHK Trophy earlier this month puts her in prime position to secure a place for the GP Final. A podium finish will do it for the young star. Mihara, who came in fourth at the NHK Trophy, would have to win in France and then hope the results of others fell her way. Mihara’s training partner Kaori Sakamoto, who was second at Skate America and third at the Helsinki GP, will only be able to sit back and watch to find out if she gets a spot in the GP Final. As it stands now, Satoko Miyahara and Russia’s Elizaveta Tuktamysheva have made the GP Final. The other four spots are up for grabs, with many variables in play depending on what happens this weekend. The likeliest scenario, presuming that Kihira does well, is that she, Miyahara and Sakamoto would make up half of the women’s field in Vancouver. Going into the Cup of Russia it looked like Japan might have four women in the GP Final field of six, but that was before Mako Yamashita finished a surprising seventh after nearly winning Skate Canada. Kihira, who rode her two triple axels in the free skate in Hiroshima to victory, talked the following day about including quads in her programs going forward. Mihara, meanwhile, reviewed her performance at the NHK Trophy prior to the Exhibition Gala the next day. Mihara also spoke of her admiration for Sakamoto’s talent and fortitude. Something truly heartwarming occurred last week. Yuna Shiraiwa, who finished fifth in Moscow, launched a crowdfunding campaign actnow.jp/project/figure_skate_shiraiwa/detail to help pay for her training expenses ahead of the 2022 Beijing Olympics. Shiraiwa sought ¥4 million when the account went live last Thursday. Just 24 hours later, more than ¥8 million had been pledged. Nearly week later the amount has grown to more than ¥12 million. This outpouring of support for the 16-year-old Shiraiwa illustrates just how deep the love of Japanese skating fans is for their skaters. So far more than 2,000 people have contributed amounts ranging from ¥1,000 to ¥50,000. Ice Time salutes each and every person who has donated to Shiraiwa.